This is part 8 of Categories for Programmers. Previously: Functors. See the Table of Contents. Now that you know what a functor is, and have seen a few examples, let’s see how we can build larger functors from smaller ones. In particular it’s interesting to see which type constructors (which correspond to mappings between objects in a category) can be extended to functors (which include mappings between morphisms). Since functors are morphisms in Cat (the category of categories), a lot of intuitions about morphisms — and functions in particular — apply to functors as well. For instance, just like you can have a function of two arguments, you can have a functor of two arguments, or a bifunctor. 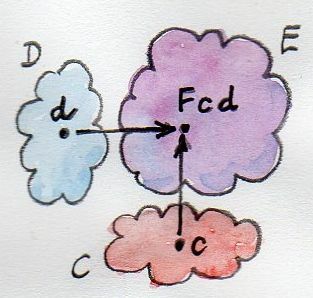 On objects, a bifunctor maps every pair of objects, one from category C, and one from category D, to an object in category E. Notice that this is just saying that it’s a mapping from a cartesian product of categories C×D to E.
That’s pretty straightforward. But functoriality means that a bifunctor has to map morphisms as well. This time, though, it must map a pair of morphisms, one from C and one from D, to a morphism in E.
The composition is associative and it has an identity — a pair of identity morphisms (id, id). So a cartesian product of categories is indeed a category. But an easier way to think about bifunctors is that they are functors in both arguments. So instead of translating functorial laws — associativity and identity preservation — from functors to bifunctors, it’s enough to check them separately for each argument. If you have a mapping from a pair of categories to a third category, and you prove that it is functorial in each argument separately (i.e., keeping the other argument constant), then the mapping is automatically a bifunctor. By functorial I mean that it acts on morphisms like an honest functor. 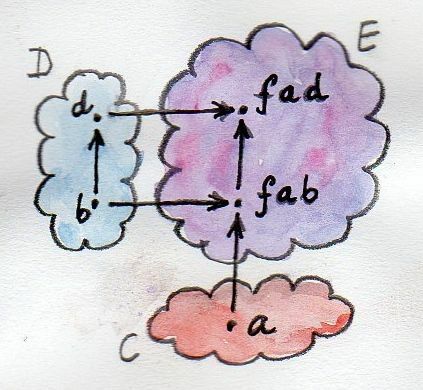 The two other type signatures, first and second, are the two fmaps witnessing the functoriality of f in the first and the second argument, respectively. The typeclass definition provides default implementations for both of them in terms of bimap. When declaring an instance of Bifunctor, you have a choice of either implementing bimap and accepting the defaults for first and second, or implementing both first and second and accepting the default for bimap (of course, you may implement all three of them, but then it’s up to you to make sure they are related to each other in this manner). This code also writes itself. Now, remember when we talked about monoidal categories? A monoidal category defines a binary operator acting on objects, together with a unit object. I mentioned that Set is a monoidal category with respect to cartesian product, with the singleton set as a unit. And it’s also a monoidal category with respect to disjoint union, with the empty set as a unit. What I haven’t mentioned is that one of the requirements for a monoidal category is that the binary operator be a bifunctor. This is a very important requirement — we want the monoidal product to be compatible with the structure of the category, which is defined by morphisms. We are now one step closer to the full definition of a monoidal category (we still need to learn about naturality, before we can get there). We’ve seen several examples of parameterized data types that turned out to be functors — we were able to define fmap for them. Complex data types are constructed from simpler data types. In particular, algebraic data types (ADTs) are created using sums and products. We have just seen that sums and products are functorial. We also know that functors compose. So if we can show that the basic building blocks of ADTs are functorial, we’ll know that parameterized ADTs are functorial too. So what are the building blocks of parameterized algebraic data types? First, there are the items that have no dependency on the type parameter of the functor, like Nothing in Maybe, or Nil in List. They are equivalent to the Const functor. Remember, the Const functor ignores its type parameter (really, the second type parameter, which is the one of interest to us, the first one being kept constant). You can think of Identity as the simplest possible container that always stores just one (immutable) value of type a. Everything else in algebraic data structures is constructed from these two primitives using products and sums. We’ve already seen that a composition of functors is a functor — we can easily convince ourselves that the same is true of bifunctors. All we need is to figure out how a composition of a bifunctor with two functors works on morphisms. Given two morphisms, we simply lift one with one functor and the other with the other functor. We then lift the resulting pair of lifted morphisms with the bifunctor. That’s the composition on objects, or types. Notice how in Haskell we apply type constructors to types, just like we apply functions to arguments. The syntax is the same. If you’re getting a little lost, try applying BiComp to Either, Const (), Identity, a, and b, in this order. You will recover our bare-bone version of Maybe b (a is ignored). The implementation of bimap for BiComp is given in terms of bimap for bf and the two fmaps for fu and gu. The compiler automatically infers all the types and picks the correct overloaded functions whenever BiComp is used. If you like jigsaw puzzles, these kinds of type manipulations can provide hours of entertainment. So it turns out that we didn’t have to prove that Maybe was a functor — this fact followed from the way it was constructed as a sum of two functorial primitives. and the corresponding fmap will be implemented for you. The regularity of algebraic data structures makes it possible to derive instances not only of Functor but of several other type classes, including the Eq type class I mentioned before. There is also the option of teaching the compiler to derive instances of your own typeclasses, but that’s a bit more advanced. The idea though is the same: You provide the behavior for the basic building blocks and sums and products, and let the compiler figure out the rest. If you are a C++ programmer, you obviously are on your own as far as implementing functors goes. However, you should be able to recognize some types of algebraic data structures in C++. If such a data structure is made into a generic template, you should be able to quickly implement fmap for it. As I mentioned before, one way of implementing sum types in C++ is through class hierarchies. It would be natural, in an object-oriented language, to implement fmap as a virtual function of the base class Functor and then override it in all subclasses. Unfortunately this is impossible because fmap is a template, parameterized not only by the type of the object it’s acting upon (the this pointer) but also by the return type of the function that’s been applied to it. Virtual functions cannot be templatized in C++. We’ll implement fmap as a generic free function, and we’ll replace pattern matching with dynamic_cast. When implementing fmap we take advantage of dynamic dispatching on the type of the Tree. The Leaf case applies the Identity version of fmap, and the Node case is treated like a bifunctor composed with two copies of the Tree functor. As a C++ programmer, you’re probably not used to analyzing code in these terms, but it’s a good exercise in categorical thinking. For simplicity, I decided to ignore memory and resource management issues, but in production code you would probably use smart pointers (unique or shared, depending on your policy). This implementation can also be automatically derived by the compiler. I promised that I would come back to the Kleisli category I described earlier. Morphisms in that category were represented as “embellished” functions returning the Writer data structure. I said that the embellishment was somehow related to endofunctors. And, indeed, the Writer type constructor is functorial in a. We don’t even have to implement fmap for it, because it’s just a simple product type. Here, the fish operator combines two functions: one of them is the familiar id, and the other is a lambda that applies return to the result of acting with f on the lambda’s argument. The hardest part to wrap your brain around is probably the use of id. Isn’t the argument to the fish operator supposed to be a function that takes a “normal” type and returns an embellished type? Well, not really. Nobody says that a in a -> Writer b must be a “normal” type. It’s a type variable, so it can be anything, in particular it can be an embellished type, like Writer b. So id will take Writer a and turn it into Writer a. The fish operator will fish out the value of a and pass it as x to the lambda. There, f will turn it into a b and return will embellish it, making it Writer b. Putting it all together, we end up with a function that takes Writer a and returns Writer b, exactly what fmap is supposed to produce. You might wonder if the fmap we have just defined is the same fmap the compiler would have derived for us with deriving Functor. Interestingly enough, it is. This is due to the way Haskell implements polymorphic functions. It’s called parametric polymorphism, and it’s a source of so called theorems for free. One of those theorems says that, if there is an implementation of fmap for a given type constructor, one that preserves identity, then it must be unique. But just like the pair type constructor, or the Either type constructor, the function type constructor takes two type arguments. 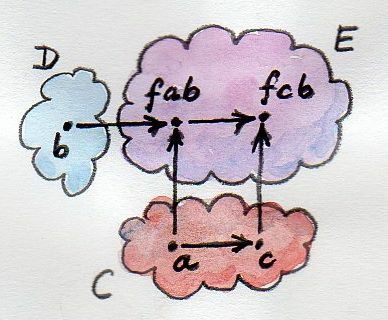 The pair and Either were functorial in both arguments — they were bifunctors. Is the function constructor a bifunctor too? With just two functions taking a and returning, respectively, b and r, there is simply no way to build a function taking b and returning r! It would be different if we could somehow invert the first function, so that it took b and returned a instead. We can’t invert an arbitrary function, but we can go to the opposite category. A short recap: For every category C there is a dual category Cop. It’s a category with the same objects as C, but with all the arrows reversed. 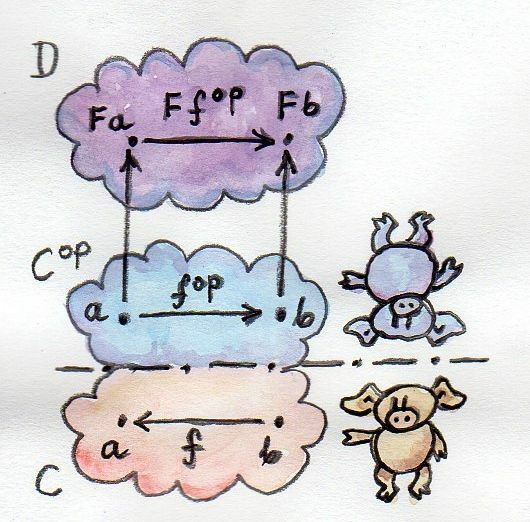 Such a functor maps a morphism fop :: a → b in Cop to the morphism F fop :: F a → F b in D. But the morphism fop secretly corresponds to some morphism f :: b → a in the original category C. Notice the inversion. Now, F is a regular functor, but there is another mapping we can define based on F, which is not a functor — let’s call it G. It’s a mapping from C to D. It maps objects the same way F does, but when it comes to mapping morphisms, it reverses them. 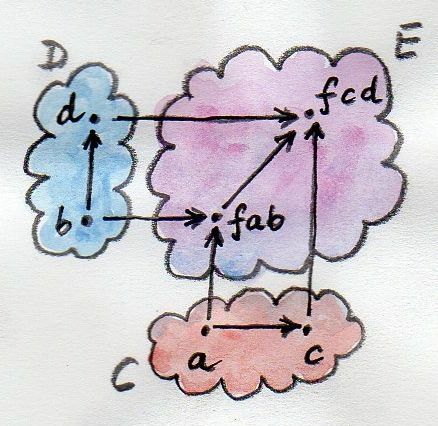 It takes a morphism f :: b → a in C, maps it first to the opposite morphism fop :: a → b and then uses the functor F on it, to get F fop :: F a → F b.
It’s a “functor with a twist.” A mapping of categories that inverts the direction of morphisms in this manner is called a contravariant functor. Notice that a contravariant functor is just a regular functor from the opposite category. The regular functors, by the way — the kind we’ve been studying thus far — are called covariant functors. Notice that the function f inserts itself before (that is, to the right of) the contents of Op — the function g.
All three functions come with default implementations. Just like with Bifunctor, when declaring an instance of Profunctor, you have a choice of either implementing dimap and accepting the defaults for lmap and rmap, or implementing both lmap and rmap and accepting the default for dimap. Profunctors have their application in the Haskell lens library. We’ll see them again when we talk about ends and coends. The above examples are the reflection of a more general statement that the mapping that takes a pair of objects a and b and assigns to it the set of morphisms between them, the hom-set C(a, b), is a functor. It is a functor from the product category Cop×C to the category of sets, Set. which is an element of C(a', b'). As you can see, the hom-functor is a special case of a profunctor. is a bifunctor. For additional credit implement all three methods of Bifunctor and use equational reasoning to show that these definitions are compatible with the default implementations whenever they can be applied. Hint: Define two mappings between the two implementations. For additional credit, show that they are the inverse of each other using equational reasoning. Let’s try another data structure. I call it a PreList because it’s a precursor to a List. It replaces recursion with a type parameter b. You could recover our earlier definition of a List by recursively applying PreList to itself (we’ll see how it’s done when we talk about fixed points). Show that PreList is an instance of Bifunctor. For additional credit, check your solutions agains Conor McBride’s paper Clowns to the Left of me, Jokers to the Right. Define a bifunctor in a language other than Haskell. Implement bimap for a generic pair in that language. Should std::map be considered a bifunctor or a profunctor in the two template arguments Key and T? How would you redesign this data type to make it so? As usual, big thanks go to Gershom Bazerman for reviewing this article. Reblogged this on Jarek Przygódzki. Blog programisty. We are patiently waiting for next chunk of wisdom. I think it will be natural transformations and monads from CT point of view. Can be List rewritten in terms of Either like Maybe? which is not recursive but it has a free type parameter a inserted in place of recursion (here, in place of the tail). This part can be rewritten in terms of Either, etc. A recursive list is then defined as a fixed point of this functor. See my posts about algebras. Can I say that a TriFunctor where (a -> x) -> (b -> y) -> (c -> z) -> f a b c -> f x y z , is isomorphic to combination of Bifunctor with Functor ? What do you mean by “combination”? Is it correct to say that such TriFunctor is isomorphic to Functor which receives a tuple of 3 values or a Bifunctor which receives a tuple with 2 values as first argument and a single value as a second argument ? I don’t have a formal proof but the intuition is that functors are morphisms in the category of (small) categories Cat (see my blog post on natural transformation for more details), which is cartesian closed. It means that it supports products and currying. So a trifunctor is just a functor that returns a bifunctor. This is definitely true in Haskell, where type constructors are curried, and trimap may be implemented in terms of map and bimap. 1). Rename Op b to Op r in the first line. 2). Set correct concrete types in the comment. 3). (optional) Add one more comment with type, where Ops are replaced with the ‘real’ function types (Op r a = a -> r). Now it looks more clearly to me, don’t it? @karkunov: Good catch! Fixed it! The full Haskell example would use newtype and pattern matching, but I didn’t want to obscure the simple point. thank you, Bartosz, for this masterpiece of clarity. It looks like that there’s a slight mistake in the definition of Bifunctor. The definition of the second function seems to be a typo. If I understand well, then: instead of second = bimap id it should be second = bimap id h.
The problem seems to appear in the original Haskell source as well (ie. Control.Bifunctor v.0.44.4). It’s the latter interpretation that makes this code work. It’s just currying. I’ve got it:-) Also I’ve caught my mistake. There’s no argument in the declaration of second. That is: this would be mistaken: second h = bimap id. But the declaration is different: second = bimap id and this works through currying as you pointed. Taking this two into account, shouldn’t the type signature of bimap be? I see how it could be confusing: there are two different bimaps, one for bf and one for BiComp. I’ll add a subscript to it to clarify this point. Hi Bartosz, the comment about separate functoriality being equivalent to bifunctoriality is (perhaps surprisingly) incorrect without an extra condition on the two actions. This is sometimes used to model evaluation order (see work on “Premonoidal Categories” and “Freyd Categories”). It is indeed surprising, but it makes sense. In principle the two maps don’t have to commute. I’ll have to fix it. Thanks for catching this! when discussing the contravariant functor but wouldn’t picking a morphism from C^op be an inverted function in the category Hask? I’ve learned so much from you, thanks! As of ghc 8.0.2 I found Bifunctor defined in Data.Bifunctor and not Control.Bifunctor. I am trying to wrap my head around the idea of Profunctors, but it is hard for me. It appears to me that the idea of Profunctors is some sort of a generalization of plain old functions, like you can compose functions placing them before or after other functions, Profunctors allow do similar things, like if a Profunctor needs to be prepended with something then its contravariant part (lmap) is used, if it needs to prepend something else then its covariant part (rmap) is used. Correct me if I am wrong, please. Also I can’t understand how the definition of Profunctor maps to it’s typeclass definition in Haskell, could you please elaborate on it? There is a way of looking at profunctors as generalized hom-sets. You put the two categories C and D side by side. 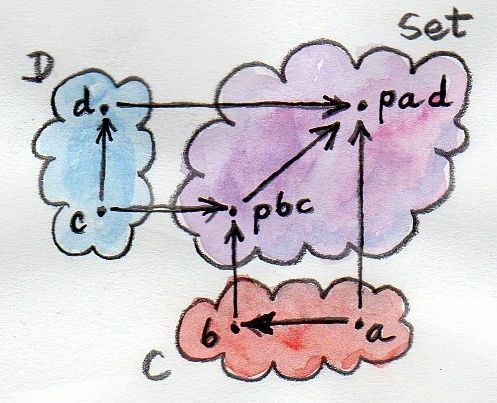 You have morphisms in C and morphisms in D. A profunctor p provides morphisms from C to D. For every pair of objects c and d, it produces a set, which acts like a hom-set between c and d. The elements of this set are called heteromorphisms. You can compose morphisms with heteromorphisms using lmap and rmap to get other heteromorphisms. If you understand Haskell definition of a functor as lifting a morphism, a profunctor lifts a pair of morphisms. Thank you, that is a great explanation. Not everything is clear for me now, but you gave me a new perspective. BTW, my understanding of the Functor typeclass in Haskell is that Functor preserves a structure: if there is a morphism in the source category there has to be a corresponding morphism in the target category. Is there a better way to look at it in order to understand Profunctors? Indeed, you can think of a product category C^op x D and having pairs of objects as objects and pairs of morphisms (the first going backwards) as morphisms. Then a profunctor preserves the structure given by those pairs of morphisms.